Samantha Felizco is a 19-year-old artist from Marikina City. This artist started singing since she was 6 years old. It all started when she was watching MTV wherein she did what different artists such as Britney Spears and Jessa Zaragosa were doing in television. Samantha would step up of the table holding a comb pretending to be an artist. The reason why she joined the competition was because she had a dream and she believed that this could bring her closer to that dream. With regards to Samantha’s performance, she performed “Hurt” that enchanted the coaches at the beginning. Coach Lea and apl.d.ap turned their chair on a certain climax of the song. Bamboo was close to pushing the red button at the end of the song but he didn’t. As a result, two of the four coaches turned their chairs and were convinced with Samantha’s performance. 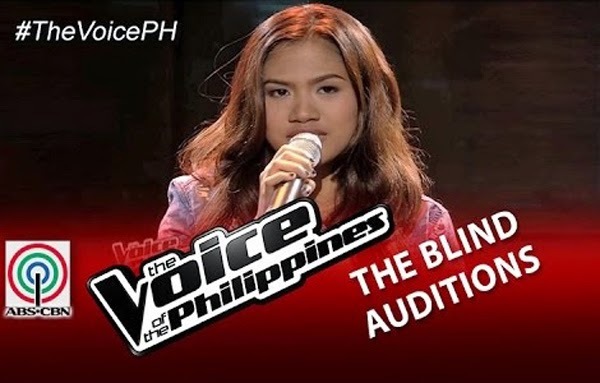 Coach Sarah liked the tone and quality of her voice along with the vibrato but she said that there was this little thing that she should polish that may be a result of her nervousness. On the other hand, Coach Lea said that she liked how emotionally connected she was to the song. Going back to her performance, she was emotional. Coach apl.d.ap said that the song fitted to her looks and personality. The two coaches did their best to convince her and it was a hard time for the artist to decide. Samantha in the end decided to join the team of Black Eyed Peas’ apl.d.ap. Congratulations to this young artist.